The DeKalb County Middle School Track Championships get underway on Saturday at Godfrey Stadium with field events beginning at 10:00 am. The two-time defending champions Chamblee Lady Bulldogs are going for a third consecutive championship title having won in 2017 and 2018 to go with titles in 2009, 2010 and 2012. 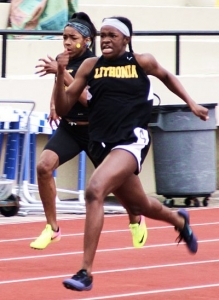 Two new girls’ sprint records were set a year ago as Rusanek Tyler-Thompson of Lithonia ran an 11.92 in the 100-meter dash and Tucker’s Mallory Hodge set the new mark of 25.22 in the 200-meter dash. The Tucker Tigers also had a convincing win by 30.5 points (84.50-54.00) over 2017 champion Chapel Hill to win the Tigers’ third title in five seasons (2014-2018) including back-to-back titles in 2014-15. Tucker had finished second two consecutive years (2016-17) before breaking through again in 2018. Setting a new record in the 1600-meter sprint medley got the Tigers rolling during the track finals as the group of Hassan Coleman, Joshua Morgan, David Williams and Abdul Kerebo ran a time of 3:58.94. The shot put and long jump field events get started at 10:00 am on Saturday with prelims getting underway at 12:00 pm with the 1600-meter sprint medley. Finals on the track are set for a 5:00 pm start on Monday (March 18) beginning with the 1600m sprint medley. The final races are set for 7:05 pm in the always exciting 4×400 meter relay finals.